Muted mesh dye baskets make inventive, beautiful pendant lights. 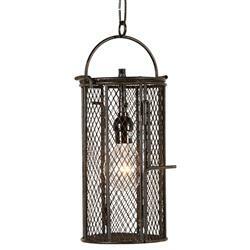 Blackened iron lends a rustic vibe surrounding a single bulb. Six inch chain allows flexible length for this handsome, hanging fixture.